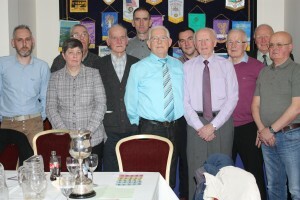 For the first time in its long history the Mid Antrim presentation was made at one function, previously the awards were presented at the various clubs. MAC officials and members joined with the members of Ballymena & District at the function held in the Adair Arms Hotel in Ballymena the week prior to Blackpool. In the old day every local club had a dinner and prize presentation, now a number don’t. Away back at the start there was no awards at all, for a long time we just published results. The late Davy Campbell gathered up all the results and wrote out by hand the leading 30 to 40 top lofts in the weekly races which were a lot fewer then that what we have now. It was a time when the shorter lofts racing in Sect B dominated each week, be it either in Crumlin, Muckamore or Antrim who had three clubs. 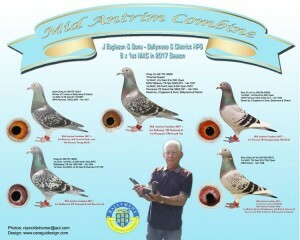 Good birds in the Ballymena Area where we had six clubs competing with several thousand birds had to be content with a good position at the top of Sect B – but nothing for the winners or best bird. In those days no meetings, no membership, and no fees nothing at all except a list of positions published for each race. Except for a few minor disturbances and disagreements it run for many years and gave great enjoyment to the vast majority of the local fancy, I have been trying to get back to that. Ballymena & Dist lofts dominated the most recent racing season, 12 x 1sts in the MAC and 6 of those won by the clubs top flyers J Eagleson & Sons. After taking a short period away from the sport the team have been Highest Prize-winners for the last two seasons, in their heyday they had done this many times in both Ballymena & District and Harryville HPS and had won 1st Open in both the NIPA and INFC plus winners of the NI Fancier of the Year award. Picture Parade MAC Birds click here! Report on 2018 Celebrations click here!